On August 1, 1944, a German 88mm artillery shell detonated near U.S. infantryman Murphy Higginbotham, sending shards of metal through his right leg and shoulder, and into the left side of his back. While Higginbotham recuperated in a hospital a letter arrived from his parents in Texas. Incapacitated and unable to respond, Higginbotham had a friend write about his progress. "I got your letter of September 4th with Murphy's address [at the hospital]. So, I checked up and found where he was located, and left the same afternoon," he wrote. "At first they thought they would have to take his leg off. You see, it was long before they really could treat him, as it should have been, and the doctor said that when he first got there it was such a dirty wound, and had gas gangrene. But, they started treating him with the new ‘wonder drug' penicillin and it brought him around ok."
Several months later, in an Italian hospital, bacteria ravaged the body of British Army sergeant Len Scott. What began as a minor case of athlete's foot turned into ugly boils that spread out along his legs. Doctors called it "diphtheria of the skin." In several weeks the inflammation spread to his arms and hands. "Medical conferences at the foot of my still-too-small-bed were more frequent. I heard a new word mentioned–penicillin. …Things grew better, sores disappeared." 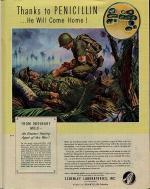 Before the introduction of penicillin in World War II, wounded soldiers were more likely to die of bacterial infections than from their wounds. With inadequate knowledge of how the body healed itself, doctors often were encouraged by the presence of "laudable pus." Others sought to treat the after effects of infection, like gas gangrene, with hydrochloric acid. Penicillin, however, which halts the division of the bacteria, could treat infection at its source. The chemotherapeutic attributes of penicillin had first been discovered by Alexander Fleming in 1928. In the 1930s, Oxford scientists Howard Florey and Ernst Boris proved the antibiotic's capabilities when mice infected with lethal amount of bacteria fully recovered after the scientists injected them with pure doses of penicillin developed from a specimen of Fleming's mold. News of Florey and Chain's achievement soon reached a quiet young Pennsylvania scientist, Granville Raymond Rettew. Born in West Chester on April 19, 1903, Rettew had studied chemistry at the University of Delaware and Swarthmore College. While employed by the Charles E. Hines Company in Philadelphia, he had become interested in improving mushroom growth by refining the production of mushroom spawn, a mixture of mycelium root structure and sterilized cereal grain that Hines sold to mushroom growers. Convinced that the mushroom cultivators "needed scientific study and help," Rettew founded the Chester County Mushroom Laboratories in West Chester and began systematizing the production of quality, marketable spawn in sophisticated labs that boasted sterile air-conditioned growing rooms and UV lights. A tireless tinkerer, Rettew patented a device for collecting mushroom spawn and collaborated with food packagers to develop new processes for freezing produce. When not developing better spawn, better insecticides, or better mushrooms, Rettew was in his lab working on his "hobby": the extraction of useful compounds from mushrooms. The United States' entry into the World War II in December 1941 prompted the mycologist to assess "whether or not there was anything which could be of help to the War effort." His hobby, Rettew rightly figured, had potential benefits for American fighting man. Having studied penicillin intermittently since 1928, Rettew knew of Florey and Chain's research. He also knew that by altering the culture, or medium in which the mycelium grew, he could improve the quality of the spawn. He figured the same process would apply to penicillin growth. "This," he wrote in his memoirs, "would be our way of contributing to the War effort." Funded by the federal government and John Wyeth and Brother Incorporated, a subsidiary of the American Home Products Corporation, Rettew went to work with penicillin samples provided by the Department of Agriculture's Northern Regional Research Laboratory at Peoria, Illinois. Using his own lab's UV lights and temperature control mechanisms to meticulously sterilize the medium bottles, Rettew was soon able to produce five-gallon drums of penicillin–but there was a problem. "Since penicillin was not particularly stable," Rettew later wrote, "degradation was often faster than separation of the liquids." The solution, it turned out, was to use a centrifuge manufactured by the Sharpless Cream Separator Company of West Chester to separate the penicillin from the growth medium. "Penicillin production today would not be possible without this method," Rettew later noted. He then constructed a penicillin recovery building equipped with a large refrigerator, Sharpless centrifuge, and a 100-gallon tank. Thanks to Penicillin - He Will Come Home. By June 1943, Rettew's Chester County Mushroom Laboratories were the nation's most consistent source of penicillin, more than ninety percent of which went directly to the armed forces. To meet wartime needs, the American Home Products Corporation expanded the Mushroom Labs' physical plant. Soon a new facility, built in Walter Penrose's Pennsylvania Garage at Walnut and Chestnut Streets in West Chester, was producing 32,000 surface cultures a day. By the fall of 1943, the Walnut Street Laboratory, utilizing Rettew's surface culture technique, was producing most of the world's penicillin. Rettew's plant soon attracted international attention. Visitors from American, English, and Australian pharmaceutical laboratories toured the Mushroom Laboratories. All of the twenty pharmaceutical firms authorized to make penicillin during the war anticipated a booming postwar market for antibiotics. Eventually, Wyeth assumed responsibility for penicillin production and Chester County Mushroom Laboratories spawn production was moved to Toughkenamon, Pennsylvania, where the Mushroom Supply Company was based. By May 1945, with the war in Europe ending, Rettew was named Managing Director of Wyeth Incorporated in West Chester. By 1948, the company had expanded beyond the initial West Chester labs at Walnut Street, Church Street, and in the old Chester County Mushroom Laboratories. A brand new facility on East Nield Street opened in 1952. Rettew retired from Wyeth in 1968 after twenty-six years of service. 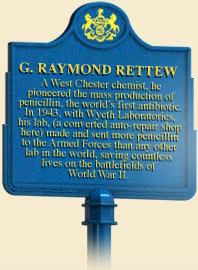 Rettew's research in penicillin production saved countless lives on the battlefields of World War II. In the decades that followed it improved the health of millions worldwide. By demonstrating that penicillin could be mass-produced, Rettew unwittingly inaugurated a lucrative antibiotics market. And by freeing scientists from a time-consuming production problem, he allowed researchers to devote themselves to improving the efficacy of antibiotics. In the decades that followed, however, the easy availability of antibiotics coupled with their over utilization brought about new strains antibiotic-resistant bacteria and thus new challenges for the scientists who follow in the footsteps of Fleming, Florey, Boris, and Rettew. G. Raymond Rettew, A Quiet Man from West Chester (West Chester, Pa: The Chester County Historical Society), 1974. John C. Sheehan, The Enchanted Ring: The Untold Story of Penicillin (Cambridge, Massachusetts: MIT Press), 1982.